Home→Pagan Library→Astral Projection→Improve Your Astral Projections! This article explores some of the common myths and misconceptions about astral projection. Let us explore some of the common myths regarding Astral Projection and how with a modern day perspective we can overcome some of the misconceptions of how it works and what it means to “travel outside of your body”. We will learn how our perception and interpretation can limit our success in experiencing this phenomenon that is as old as ancient man. Learn also how with this new perspective, along with conquering our fears, we will discover the main ingredient we will need for traveling without boundaries! How many cultures of mankind have stories regarding some kind of astral travel? Whether, it is some kind of vision quest like the Native Americans, or some sort of trance like state utilized by the likes of Nostradamus or Rasputin. Over the millennia we as a species have been exposed to the idea of traveling beyond where our physical body can take us. Over time this concept and the perception of its application has been interpreted and reinterpreted again and again throughout our civilization. What about the many misconceptions regarding astral travel? Many people are exposed to the concept of our energy body leaving our physical body and traveling through out time and space. We often visualize or report seeing a silver chord connecting our energy body to our physical one. Often time’s people will report an experience where they were starting to leave their body only to have an uncontrollable feeling of fear well up inside of them usually ending with them being snapped back into their body. The questions that arise are very interesting. First of all why is it that we perceive our energy body as looking like our own? If it was really our soul or energy body why would it have to resemble our physical body? Perhaps it is the best image our brains can relate to, therefore enabling us to interpret the situation. The other question is why do people feel they will leave there body and not be able to find there way back? This is also associated with the concept that if their chord is disconnected from their body they will die because the body can’t live without the soul. Keeping these questions in mind we must realize that man has been experiencing astral travel for millennia. The reality is that mankind’s intelligence an understanding of the world around him has changed dramatically again and again over the centuries. How we once would have interpreted a phenomenon like astral travel may not be the most intelligent way to interpret and dissect it today. There are concepts today that didn’t exist one hundred years ago much less thousands. Take a probe for example. A probe will fly into space take pictures of things thousands of miles away and relay the information back to us giving us data that we could never attain by physical means. Instead of thinking of your soul as leaving your body, let’s imagine that what is really traveling is something that is of the same frequency of your soul, and is acting more like a probe. It is traveling through time and space, collecting data and within an instant, faster than the speed of light it is relaying that information back to you. If this is the case than there would be no need to imagine a chord attaching your probe to your physical body, neither would we need to have the fear of either being trapped out of our body or never finding our way back. With this new perception we can see how the fear of death is almost completely eliminated. Another common fear is that if something happens to your astral body than you will be harmed in the physical one. Again when a probe is destroyed out in space it simply stops sending back data, it doesn’t affect the planet it is being sent from. Let us look now at energy. Let us assume for a moment that when our energy is used to create a probe, and then that energy is projected, we are in fact receiving data so fast and so vivid that it in feels as if we have literally left our body. When the connection is cut it simply ends the transmission. Let’s picture that our body’s electrical field and aura, are holding our soul within our physical body, and that the soul cannot really leave the body unless the electrical field of our body stops working due to death. With this in mind it is much more believable that it is not our soul in its entire form that leaves the body but merely a part of it, or more specifically a frequency of it. This energy is what creates the probe that can travel across time and space. So logically we can conclude that cutting the connection between the probe and ourselves does not harm us in any way but simply ends the data being transmitted. The most important realization of this perspective is that most of the time when people are snapped back into there body during a projection, or suddenly fall short of a successful projection it is because of fear. Again, fear of not finding there way back to their body, fear of being harmed physically because of their soul being harmed, or fear that the body cannot live without the soul. As the old saying says “Fear is the mind killer”. 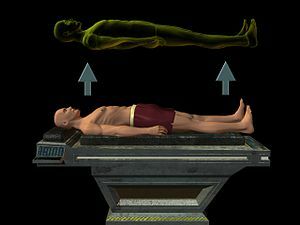 With the concept that astral projection is simply an energy probe scanning the depths of time and space, and not our soul leaving our body, we can see how fear is what’s really limiting ourselves from true Astral Travel.